Orwell: Ignorance is Strength approaches the relevance to which it aspires, but not until late in its final act. Games focusing on politicized subject matter run the risk of alienating their players by taking polarizing stands, yes, but also by tackling an issue so nascent that its real-world developments outpace the game’s tone, mechanics, and messages, rendering them inert or, worse, irrelevant. The most successful political games, like Papers, Please or This War of Mine focus more on building experiences with intentional atmosphere and refined, mechanical conceits that focus on personal outcomes. Do you risk punishment and safety to let someone cross your fictional country’s borders? How will you find enough fuel to keep the stove running tonight? I can’t cite a single instance of either game telling me how to feel about what I was experiencing, but that doesn’t mean they lack an editorial voice. Still, I have some admiration for political games that bite off a bit more than they can chew. Orwell, released in 2016 by German indie developer Osmotic Studios, is one such game. Everything about it, starting with its 1984-invoking title right down to its fictional city and country names, like Bonton instead of Boston and The Nation instead your average industrialized country, is a bit on the nose. 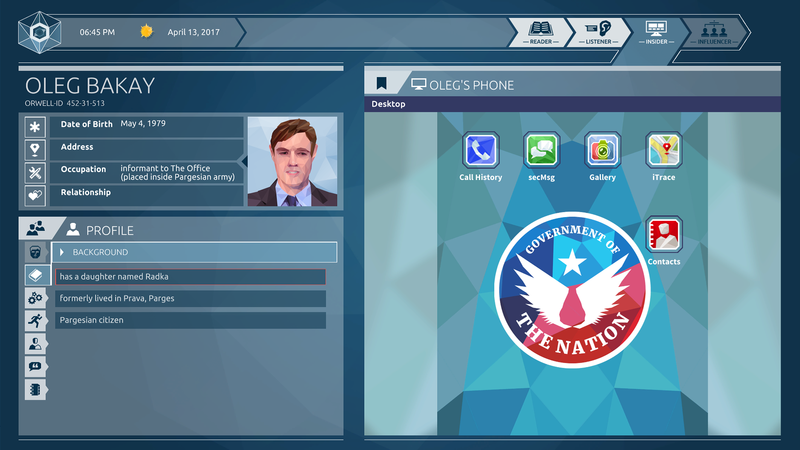 In the game, you assume the role of a recruit in The Nation’s new NSA-like data collection project Orwell. Early on, you only have access to publicly available information, such as a target’s fictional Facebook or Twitter account, but before long you are intercepting their phone calls or scrubbing their computer to determine whether they are a threat to the country’s national security. When discrete pieces of evidence are found (the game calls them datachunks), you can choose whether or not to upload them to Orwell, building a case that will potentially lead to a target’s arrest or, uh, neutralization. The process is rote but surprisingly novel. You might upload a quote of a target saying, “I’ll kill you!” only to realize a bit later that was in jest, referring to a roommate eating the last brownie. Because you have a limited number of turns to collect data, it’s sometimes not possible to reverse course once you’ve accidentally implicated a person of interest. These decision points were enough to carry the first game—Edward Snowden’s Surveillance State 2016 didn’t exist, so Orwell, even with some of its more heavy-handed elements, filled the void nicely. I’m not sure time will be kind to the first Orwell, however. The idea that individuals employed by corrupt governments are nefariously collecting and making sense of data is now quaint at best. The extent of private data collection and the limited human role is now firmly established—real-world advancements in artificial intelligence and machine learning render the game’s fictional project obsolete. Then there’s this other problem entirely—the rapid rise of mass misinformation campaigns, more affectionately known as fake news. That’s where Orwell‘s episodic sequel, Orwell: Ignorance is Strength chooses pick up the conversation, albeit in a meandering way. It was a wise choice, I think, to move the game away from its data collection conceit, for all of the reasons mentioned above, but Ignorance is Strength takes its sweet time doing it. The studio and publisher decided to release this sequel in three episodes over the course of a month; the model was perhaps meant to build suspense and introduce newcomers to the game’s brand of circuitous storytelling. I’m not sure it did the first two episodes any favors, however, because they mostly serve as a refresher to the game’s world and your role as The Nation’s ace datachunk collector. While I was amused by the new types of documents and devices I got to explore (hunting down the source of a bank transaction led me to some humorous places I won’t spoil), I couldn’t help but think I had been here before, chasing the same leads about the same two-dimensional revolutionaries. The new emphasis on a more traditional dramatic arc didn’t help matters. I guessed episode two’s big reveal in its opening minutes, and there wasn’t a whole lot there to misdirect me from that realization. 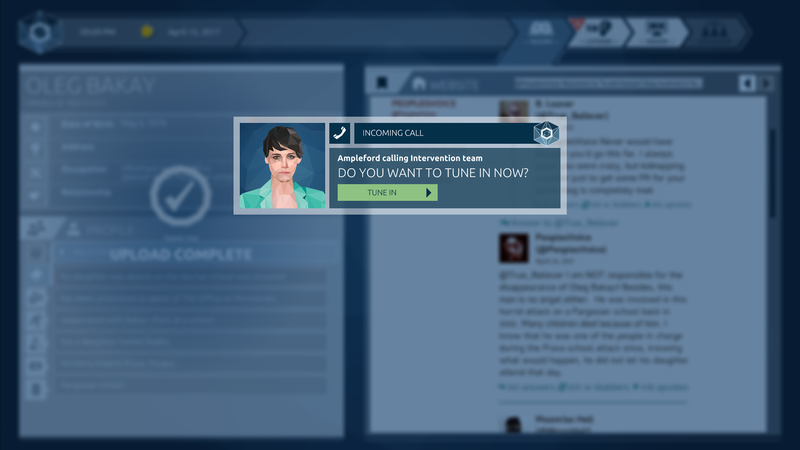 It’s too bad the first two-thirds of Orwell: Ignorance is Strength is so padded because episode three introduces the influencer tool, an intriguing complication to the game’s core play that makes a curiously late appearance. With the influencer tool, the evidence you collect for Orwell can now is now spun into narratives used to counter the stories of The Nation’s opponents. You’ll find yourself wondering which of the stories you construct will have the most impact. Do you lead with the sordid family drama or a loosely supported conspiracy theory? The influencer tool also brings the game into a more relevant political conversation, that of fabricated news and a government’s fight with the media to “control the narrative.” But even here, the game struggles to keep up with with a reality where, as I write this, Mark Zuckerberg sits in Washington answering for how his platform and its own “datachunks” could be used by third parties, such as Cambridge Analytica, to influence a national election. Still, the influencer’s introduction was the first moment when I appreciated the sequel’s ambition to keep up with the conversation. I think Osmotic Studios should be applauded for their attempt. Like Orwell before it, the power of Ignorance is Strength‘s third episode is in its ability to depict, with compelling simplicity, such a fraught, complicated topic. I just wish it had entered the fray sooner. This review is based on the PC version of the game, which was provided by Surprise Attack Games.